When a 22 year old Manny Pacquiao set foot in Freddie Roach’s gold card gym and asked him to train there, nobody not even freddy roach expected what kind of career and a superstar is coming along, and we got one of the most successful trainer/boxer relationship/partneship in the history of boxing. Pacquiao went onto win 8 world titles in 8 different weight classes while Roach was awared trainer of the year 6 times along they way and was inducted to boxing hall of fame. 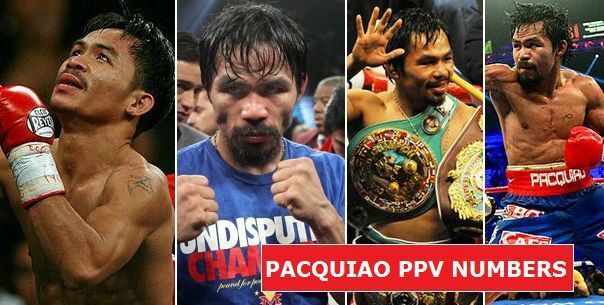 Today we take a look at Manny Pacquiao’s career PPV results which has esclated him in second postion in terms of most PPV buys and revenue generated in history of boxing. Only floyd Mayweather and Oscar De La Hoya has generated more PPV sales in history than Manny Pacquiao but in terms of revenue Pacquiao is second only to Floyd Mayweather. Lets take a look at top 5 boxers with the most PPV buys. Manny Pacquiao is undisputed boxing PPV star in the history of boxing alongside Floyd Mayweather & Oscar De La Hoya. Manny Pacquiao is the only non-american fighter to have achieve such recognition, fame and money in united states and that came when nobody expected this from a young skinny Pacquiao. Fast forward 13 years and he has become the darling of his native country, probably the most recognizable sportsmen in Asia and one of the most known athlete in the world. Pacquiao’s boxing career really took off in 2005 when he fought erik morales as it was the first time his fight generated over 10 million in revenue and after that it was no looking back. After the fight against David Diaz he really became a PPV star when he fought Oscar De La Hoya and defeated him in his first PPV event. That fought generated 1.25 million PPV buys which became one of the biggest fights in history of boxing in terms of revenue. From 2008 to 2012 every pacquiao fight generated atleast 800,000 PPV buys and 5 of them went over a million. Here is the look at his PPV and revenue numbers from the last 9 years.